A new Japanese animated feature opened theatrically in New York and I went to see it on Friday. 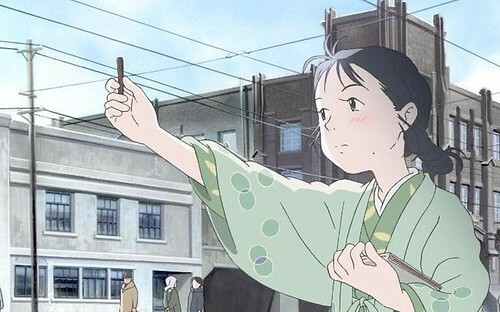 IN THIS CORNER OF THE WORLD follows Suzu, a young girl in western Japan from 1933-1946 as she goes to school, draws pictures of everything she sees and eventually is sent from Hiroshima to neighboring Kure to marry a boy in an arranged marriage and keep house for his family. The war is always in the background although its aims and causes are never discussed even after the effects of it start to hit closer and closer to home. The port of Kure is used to dock various Navy ships, including the notorious battleship Yamato, and the characters often look out over the harbor and comment on the ships and Suzu even draws pix of them. Because of all this, the town becomes a frequent target of bombing raids and Suzu and her family endure it all stoically. Eventually, the date of August 6, 1945 arrives and Hiroshima goes up in an atomic blast, witnessed by the characters in Kure. We then see a few scenes of the aftermath. It's an honest portrait of life in wartime Japan, although it lacks the emotional punch of such similar animated films as GRAVE OF THE FIREFLIES, BAREFOOT GEN and KAYOKO'S DIARY. Suzu is somewhat dimwitted and she sees the world as something to draw. Even when the bombs are hitting and the skies are filled with flak, she sees it all as pieces of art until her father-in-law slams her to the ground to cover her. There are some abstract sequences designed to convey tragic occurrences. It's a very unusual film and I found it consistently engaging, although I would like to have seen some critique of Japan's complicity in its own destruction and the way it brainwashed its citizens into a "to the last man" mindset, something referenced in the film, but without the necessary context. If they'd all died fighting, as the Japanese military government seemed to want, we wouldn't have films like this or MY NEIGHBOR TOTORO. We wouldn't have Godzilla, anime, manga, J-pop, Ultraman, Samurai films, Power Rangers, etc., etc., etc. What kind of world would that have left us? I saw the subtitled version, but a dubbed version is playing also. Last edited by Ash Ketchum; 08-13-17 at 11:29 AM. Shout! Factory is handling the home video distribution. The Blu-ray is priced fairly cheaply on Amazon's pre-order right now.